The most distinctive feature of the American Mulefoot hog is the solid hoof which resembles a horse hoof. Today, the Mulefoot is the rarest of American swine breeds. The American Mulefoot is the only documented population with a breed standard and a long history of agricultural use. 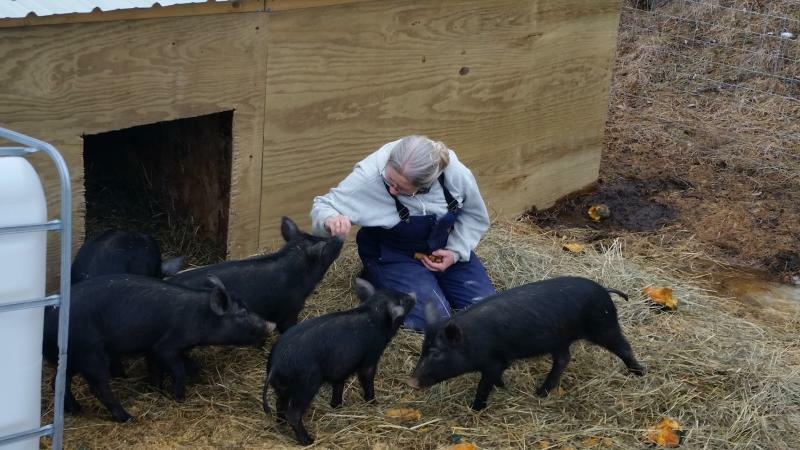 Farmers raised these hogs by putting them on islands in the Missouri and Mississippi Rivers to forage during the summer and then rounding them up in the fall for slaughter. This practice was terminated by the Army Corps of Engineers in the 1950s. The Mulefoot hog population is classified as Critical by the American Livestock Breeds Conservancy (fewer than 200 in annual registration). This breed is unique to the United States and is critically rare. It has been a conservation priority for American Livestock Breeds Conservancy for over a decade. These five gals are getting bigger every day! Soon will be ready to be bred.